This impressive teaching and learning tool offers more than 1,600 social-studies-based resource “packs.” These age-appropriate packages are engaging incentives that should inspire individual investigation and inquiry, an expectation found in information skills and Common Core content literacy standards. The user friendly, intuitive interface includes a standard keyword function, with opportunities to narrow searches by grade, category (e.g., “American Folk Heroes,” “Instruments of Navigation,” historical eras), or browsable visuals. An important feature is that in addition to accessing packs as presented, users can edit and expand content, creating new versions with unique URLs that can be shared with designated users over time (a calendar feature stores ongoing work and sends reminders about upcoming pack availability). Teachers can add self-generated content (e.g., assignment checklists or organizational tools) as well as sources gathered from websites or other exterior locations. Teachers can also differentiate content. In addition to resources that appeal to auditory or visual learners, print articles can be sorted according to three levels of text complexity, much content can be read aloud, text size can be manipulated, and machine-generated translations are available in more than 100 languages. And for students? In addition to ready-reference introductory material, this tool can provide anywhere, anytime online access to exclusive, self-created packs to store ongoing research for inquiry projects or personal information quests. User-friendly features include clickable definitions and pronunciation guides, the ability to edit articles, and citation generators. Whether used by a third-grader amassing images for a PowerPoint to determine if Millard Fillmore was a good president or a high-school junior gathering background information on human rights for a debate about immigration policies, these packs provide substantial, well-documented support. This unique resource holds obvious appeal for school libraries, for both students and teachers, especially in the areas of social studies and English language arts. Public librarians will appreciate the breadth and depth of content plus the easy access for parents and kids looking for help with school assignments. Britannica promises continued expansion of topics and features, making this a worthwhile consideration for most libraries. 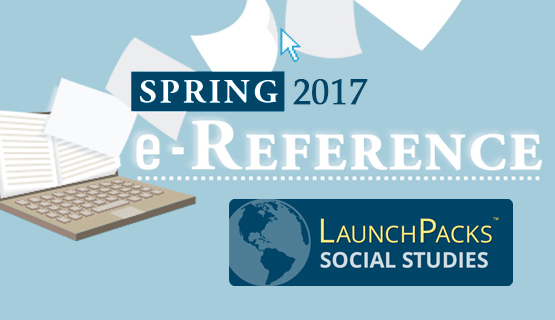 Reviewed by Kathleen McBroom, Booklist Spring e-Reference Guide. Review posted on 4/15/2017.